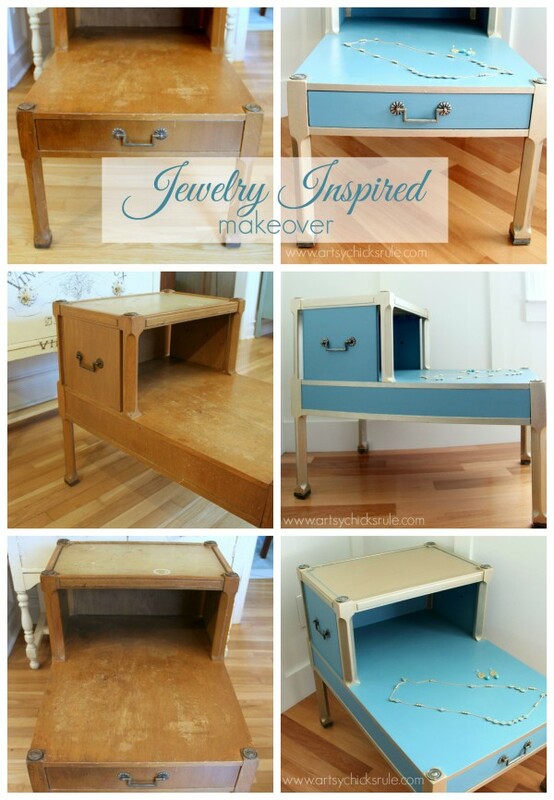 Last week I showed you guys this turquoise chalk paint & gold metallic, jewelry inspired, table makeover. …and promised to show you the details this week. Nothing too exciting and certainly in need of some love. As I mentioned in the other post, I originally had something different planned for this table. But my friends and I were doing a metallic paint challenge (paint a piece of furniture with metallic paint) so I used it for this instead. I had never really used metallic paint. I had used it to highlight pieces of metal and such. Works fabulously for that. Chosen mainly because I already had it on hand which wasn’t such a great idea because…. 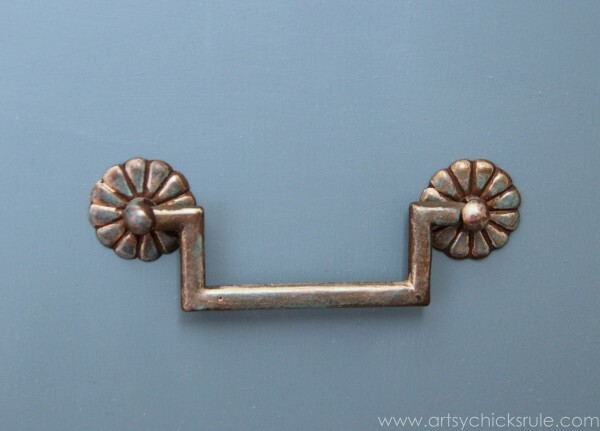 ….it’s GREAT for what I already mentioned –>giving a light touch of “antique” or gold highlights to metal hardware, etc. Not so great for actually painting furniture. Maybe her other colors have better coverage, this shade just did not. When thinking about metallics, I had originally thought I’d do something along the lines of black and silver. Definitely not gold. I don’t think I have one gold thing in my home at all. 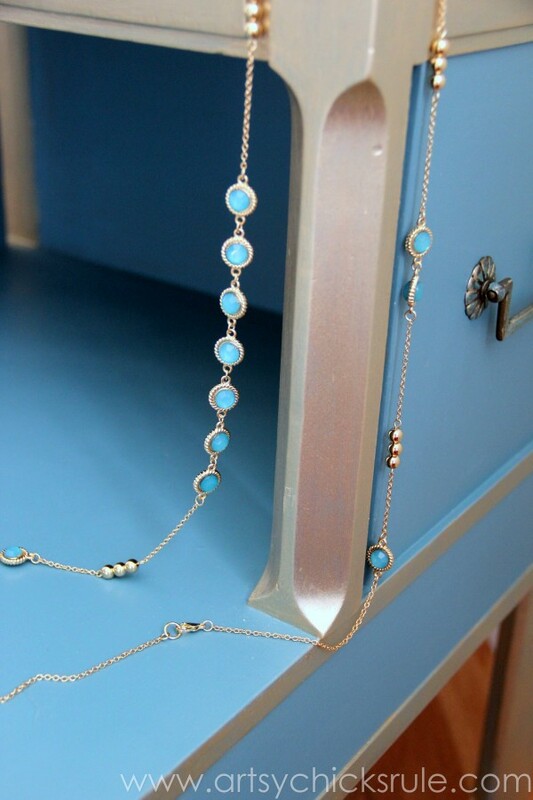 BUT I do adore gold and turquoise together. Just like the pretty jewelry in the photo. 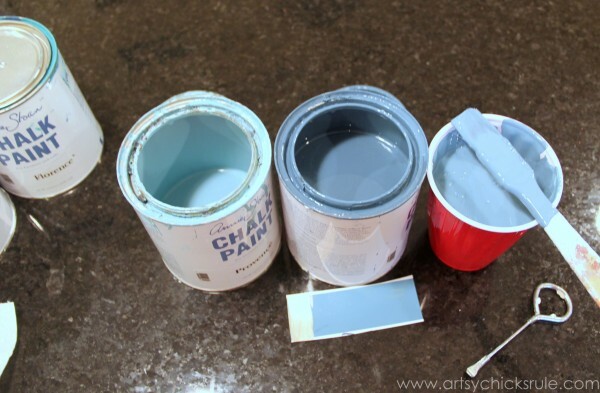 I went looking for the perfect shade and found this gorgeous blue colored paint chip. I swiped a bit of the gold across the end and…. I mixed up some Chalk Paint to match. I had originally thought I’d need all of these colors to create the turquoise shade. 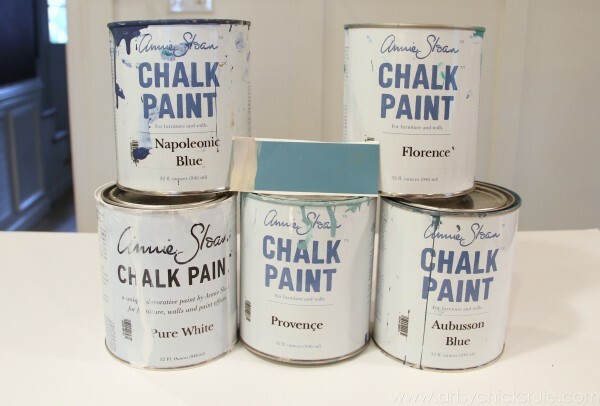 But in the end, it only took these three–> Florence, Aubusson Blue & Provence. And no…I have no clue on the proportions. Sorry! I mixed and mixed until it matched. I can tell you it’s mostly Aubusson Blue, with a bit more Provence than Florence. 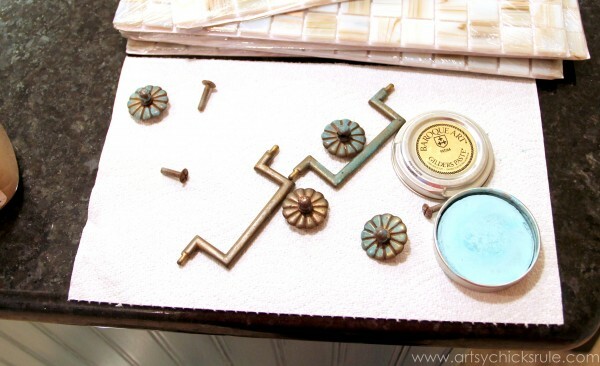 The turquoise got sealed with a coat of Annie Sloan Clear Wax. I couldn’t decide what I wanted to do with the top area. 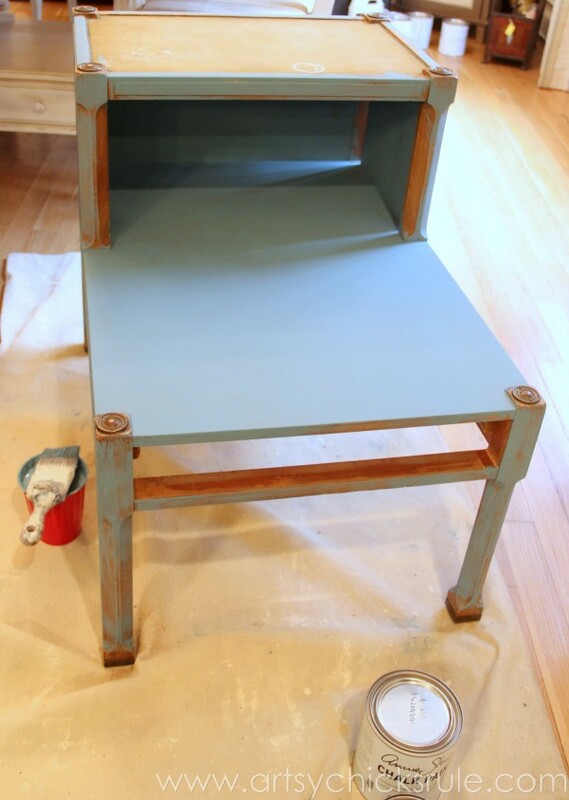 I knew I didn’t want to just paint it turquoise and be done. I considered painting a Greek key design but decided against that. 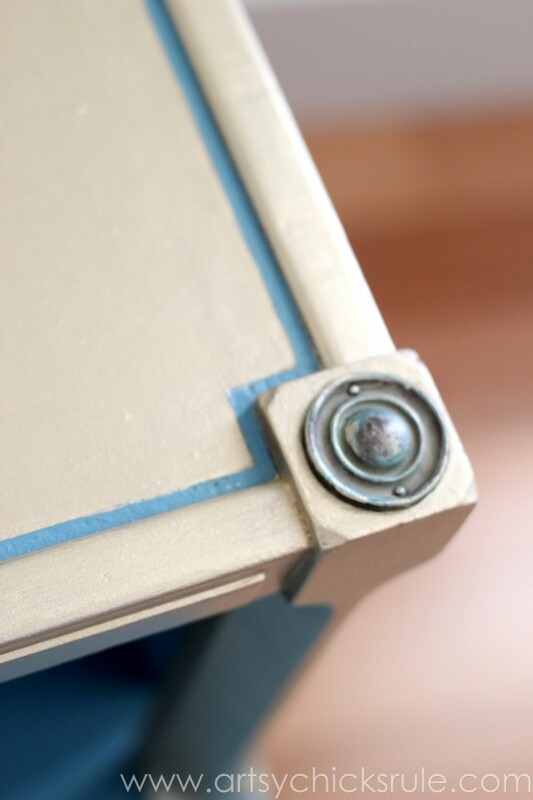 I finally decided it might be best to just keep it simple, paint it gold and recreate the pin stripe that it had originally…except in the turquoise color. I taped it off and got it ready for the pin striping. Done…..and almost ready for the gold. Next up…one coat of gold. Yea…not so much. I would need about 5 or 50 coats of that gold to cover fully. The gold was being a bugger so I came up with a better plan. And really, I knew better. I should have either painted it blue like the rest underneath or used a primer. But all that thinking about what to do with the top just threw me off! 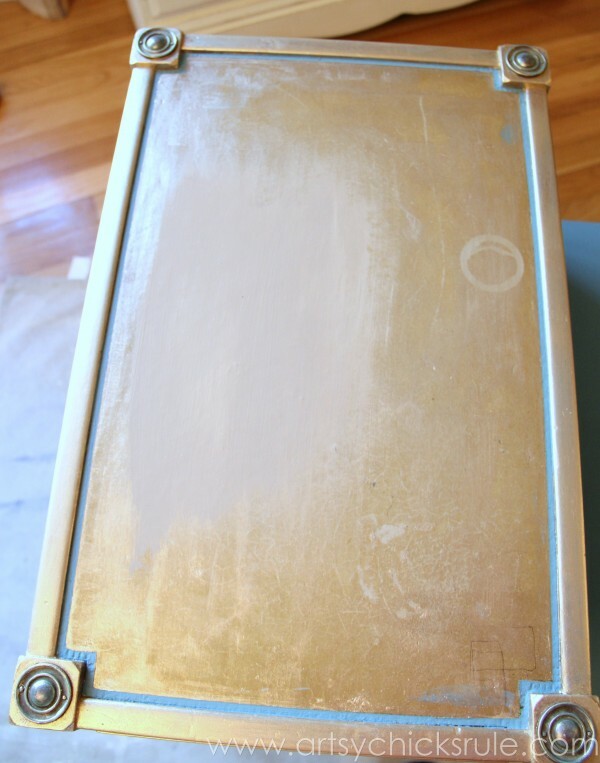 So I painted it with “Coco” Chalk Paint first (well, second, but before any more gold layers). 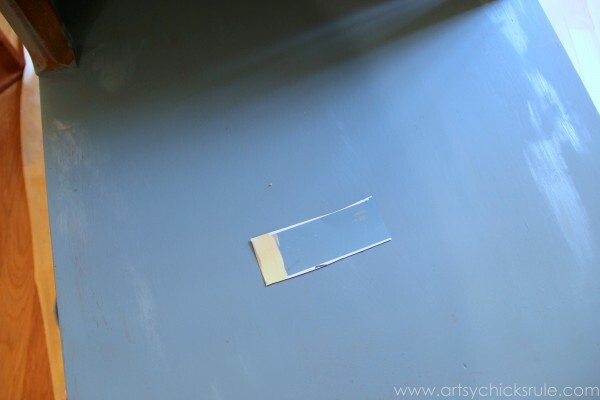 Perfect shade for the underneath…and worked great as a “primer”. Now it’s ready for the gold. Still took a few coats (but not nearly as many as it would have!) and I finally got it to look like this. I love that gold top. LOVE. I will say it was not the best product for this project BUT it truly is a gorgeous shade of gold. Metallic paint is a little bit tougher to work with anyway, in my opinion. 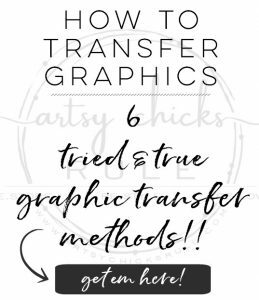 It seems to get streaky and show brush strokes…a lot. The hardware got a little special treatment too. 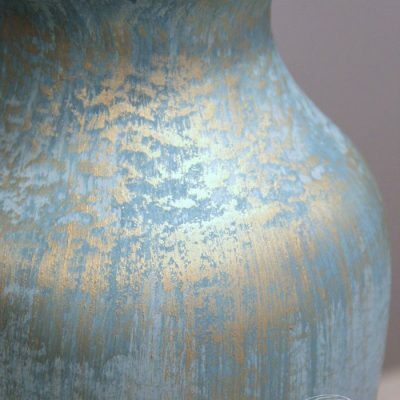 I didn’t want it to be the same gold color as the rest so I left them aged, as is, and hit them all with a bit of this fabulous “Patina” first…..
Baroque Art Gilder’s Paste….neat stuff. Then I added a bit of the gold over top of that (same gold as the table)…also with my finger tips. In my opinion, that is the exact look the hardware needed. A bit of patina and a bit of gold. 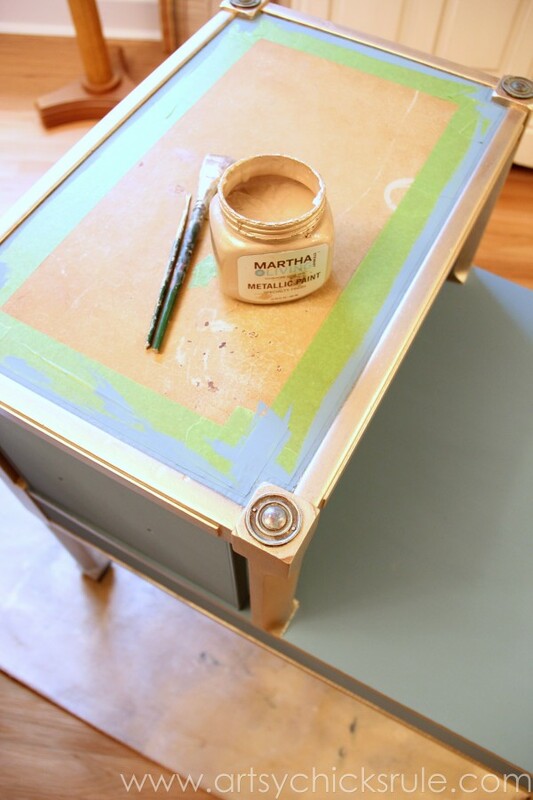 A jewelry inspired table….turquoise Chalk Paint & gold metallic. It really was a fun little challenge! 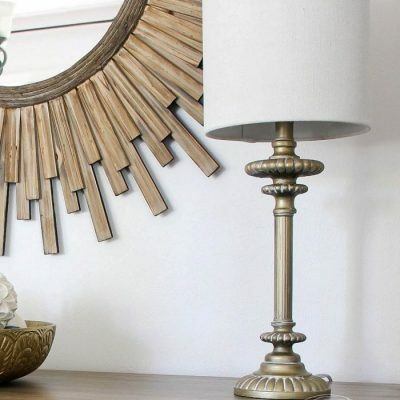 Are you a metallic paint lover? Have you ever painted with it? 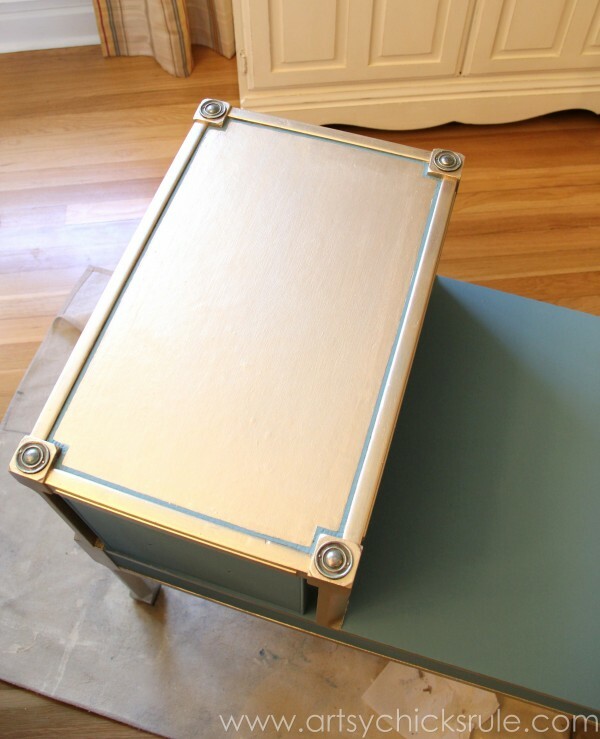 Own a piece of metallic painted furniture? 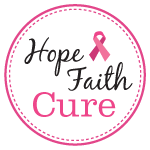 I’d love to know what you think if you have or do! Do you think using a small roller for the gold on top would have worked? 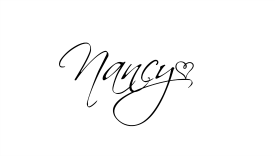 Beautiful table Nancy! 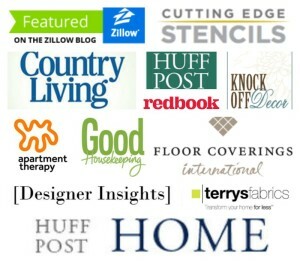 I have plans for a few pieces of metallic furniture around my place. 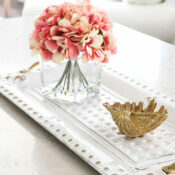 LOVE anything metallic! You did a really nice job on this piece. Have a great day! 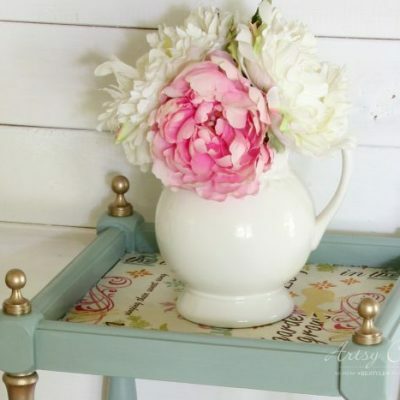 I love this new look to what my sister and I , when little girls, called step stool tables! I’m looking forward to what paint to use that really covers without so much work. 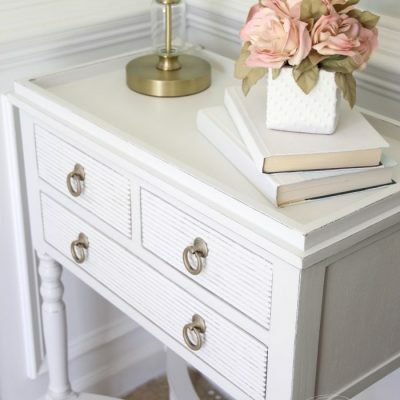 I had the girl’s white with gold edge furniture (all four of us used it at one time!) 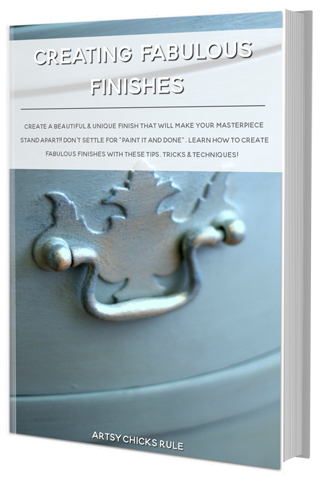 that my daughter used when little and I’d paint the trims and knobs pink then blue–I had a lady prime and then paint it with shades of browns and some strait ions of silver and gold. I used some craft paint to add a touch more silver and gold (think hair that’s woven with those aluminum sheets sticking out) and it’s all stayed for three years. But my craft paint were just add ons to the woman’s already striated wood and metallic highlights. I like it because it no longer looks like the little girl furniture of the 1960’s. In 1980 I added a bit of gold. 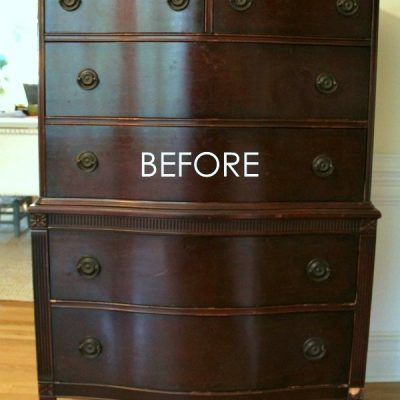 To my painted brown and streaked with darker brown and black to resemble wood. Hmmm. I see a trend going here!! I got the gold at the paint store. It also worked great. Oh, that is so neat and exactly what it looks like! Oh I know exactly what kind of furniture you are talking about (your childhood furniture)…it sounds like you made it over and looks great! Thanks so much Melanie! :) LOL, yes, I am always mixing something! ;) This was a first for me with the metallic…and I am looking forward to more. Thanks Christy! :) I know, I saw that and I couldn’t believe how great yours covered. I think it is just this particular color. It was such a pain!! lol I love that silver you used. Your table was gorgeous! Looks great! And what an unusual piece of furniture. 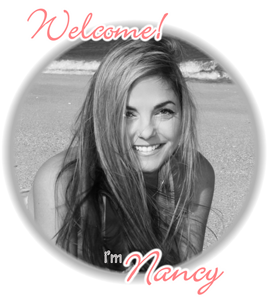 Hi, Nancy! I hadn’t realized before that the top was painted gold. I don’t know how I missed that one! But I LOVE it! I really like metallics, so I think it was a great touch! I know it was a pain to paint, but oh, so worth it in the end. The table really is gorgeous! 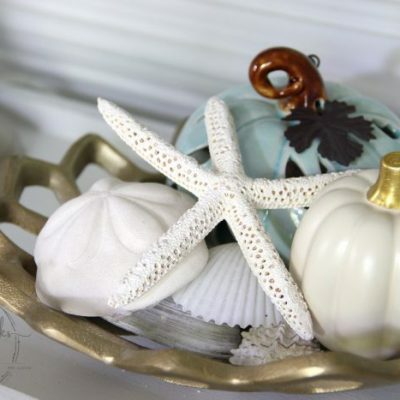 I love the color combo – such a classic look! Beautiful table, it turned out really well! I love what you did with the top! 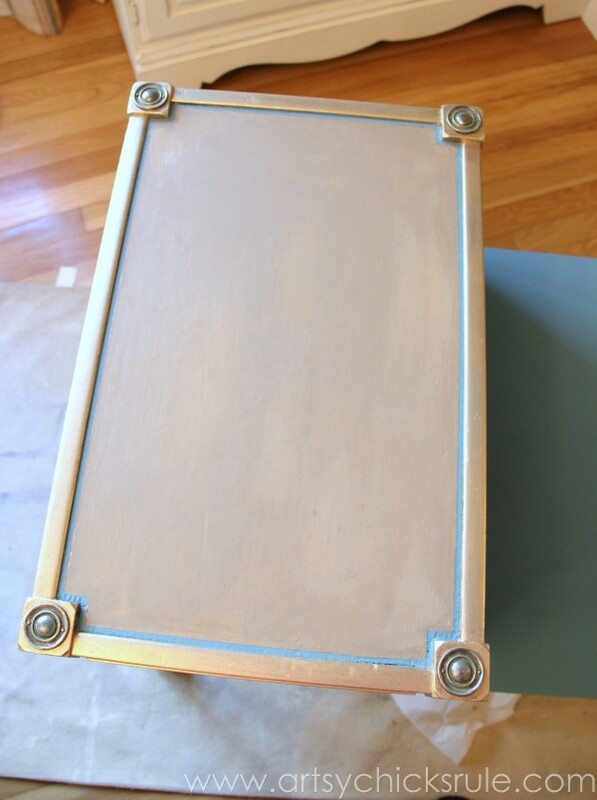 I’ve done several pieces using metallic paint… my favorite brand is Modern Masters. I think it covers well and their colors are stunning. 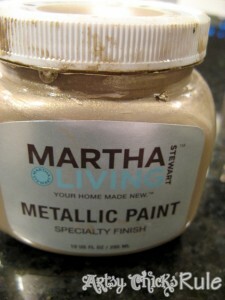 I’ve used the Martha Stewart metallic too, but I think MM is a superior product. 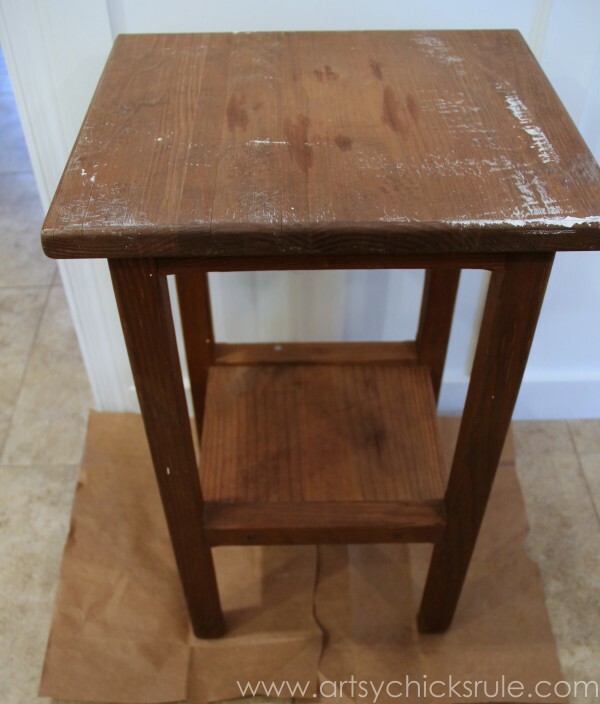 By the way, your table is what’s known as a “step table.” I just re-did one myself with Annie Sloan chalk-paint. HI Susan and thanks!!! 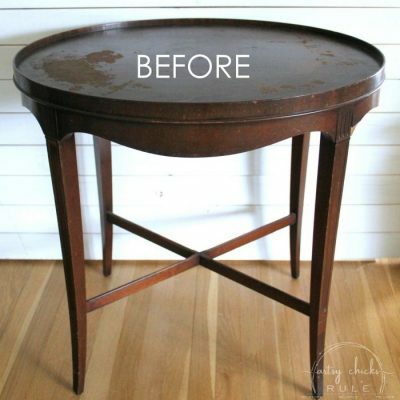 :) I love this little table but have since sold it since I am out of room in my home. 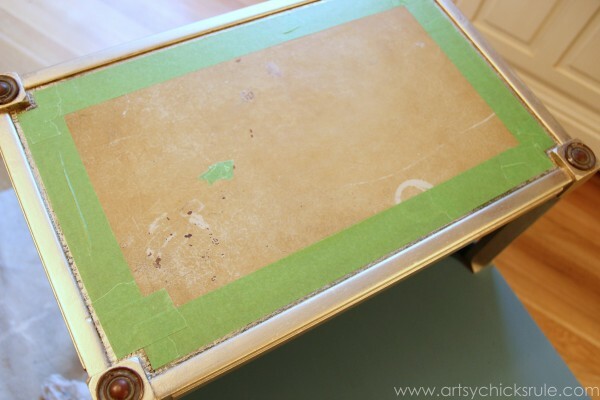 Step table…thanks for the info! How fun that you also paint. It’s so addicting isn’t it? 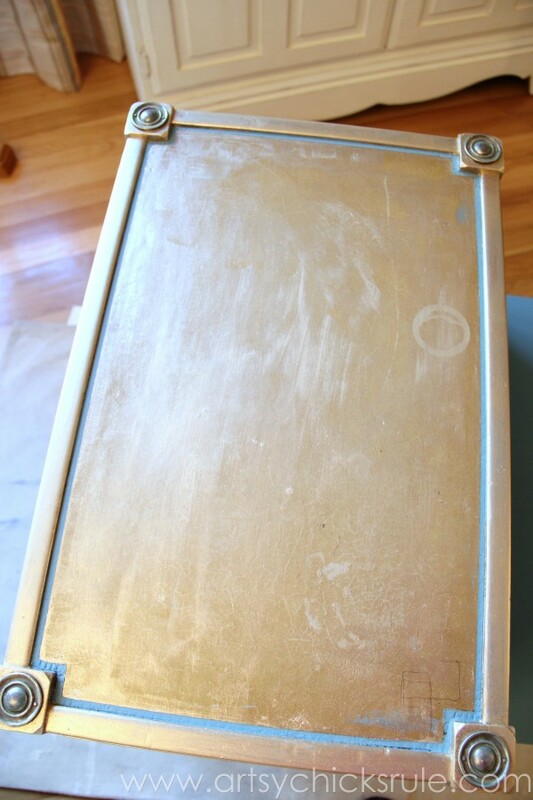 Yeah, I’ve been painting furniture for as long as I can remember but always used latex until I delved into the wonderful world of chalk-paint and that was all she wrote. haha! 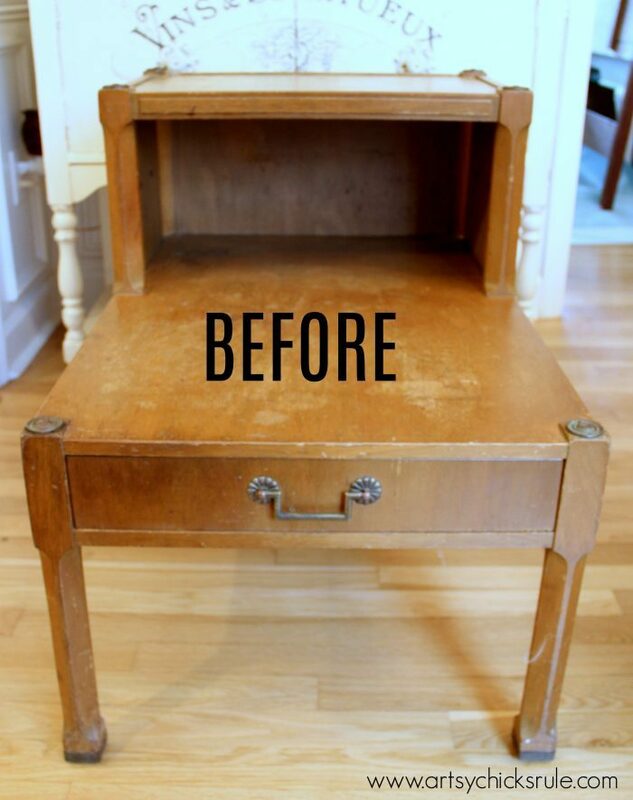 I always rehabbed furniture for myself and family, but about a year ago, I began consigning with a local furniture store and I just LOVE IT! 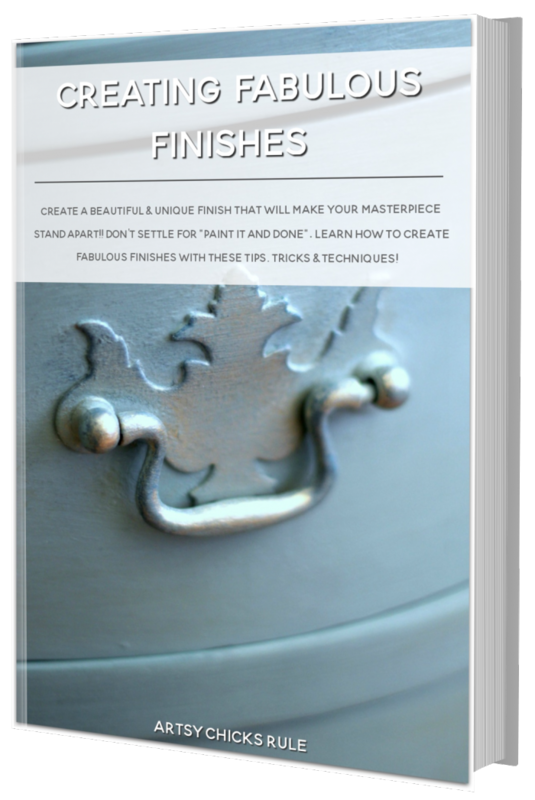 I can fulfill my passion for reviving vintage furniture without cluttering up my home too much and putting a little extra cash in my pocket. It’s my empty-nest therapy now that my son is all grown up. haha!!! 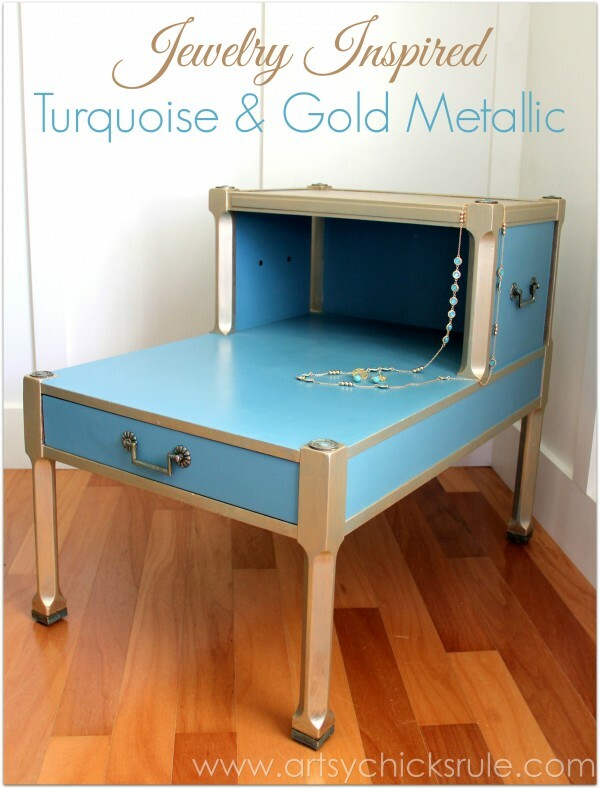 I did a turquoise and gold little bookcase very similar to this. I will try to post a picture for you sometime. It didn’t turn out nearly as cute as yours, but it is very cute. It was an old piece that had belonged to my grandmother, and I love it.